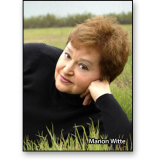 Publisher : Angel Heart Publishing, Inc.
Little Madhouse on the Prairie is Marion Witte's compelling chronicle of growing up as an abused child on a North Dakota farm in the 1950s. Her story begins two generations earlier, when her immigrant grandparents struggled to eke out a living on the unforgiving Midwestern plains. With clear-eyed compassion, Witte describes lives of unimaginable difficulty. Too often, frustration and hopelessness erupted in alcoholism and violence. Little Marion had an older brother and younger sister, but it was she who was the preferred target of her mother's wrath. The beatings, punishments and neglect were all but ignored by her family, leading her to believe she must certainly have earned her mother's fury in some unfathomable way. Only after making friends with a schoolmate who invited her into her own warm and supportive home does young Marion begin to sense that a different and better way of life existed outside the Witte family farm. Marion realizes that academic success is her ticket to freedom, so she works hard to put herself through college in three years and score one career achievement after another. But not even career triumphs, a wonderful husband and a beloved child are enough to quell the internal demons that prevent her from living an authentic life. To heal herself, she embarks on a solo journey to discover her true identity. After years of work, Witte finally reconciles with the wounded child inside. From this place of hard-earned harmony, the author has dedicated herself to work tirelessly for the right of children to be free of emotional and physical abuse. In 2005, she founded the Angel Heart Foundation, whose vision is "All Children Deserve A Safe and Just World." By shedding light on the cultural roots of her own abuse, Witte sets the stage for a way out of the cycle of violence of all children. Little Madhouse on the Prairie is an impassioned plea for action to extend human rights to the planet's youngest citizens. Witte's memoir shares the path she took to her own recovery, and she offers hope and inspiration to those who desire to heal from the wounds of their own abuse. A MUST READ FOR EVERYONE WHO WAS EVER A CHILD!!! It is my true wish that EVERYONE read this book, and recognize the power of acknowledgement and forgiveness - not that we have to forget or condone actions of our families - but recognizing we have a choice to take responsibility for our present life. Marion's book is a MUST READ, as a way to understand how families' behaviors overtly and subtlety affect children for the rest of their lives, and how the power of facing the lions and tigers and bears can bring us to a place of acceptance, self-love, and peace. I doubt there is anyone who doesn't recall some element of an unfortunate event in their childhood, and yet there are so many of us who have experienced the physical and psychological abuse dealt by troubled, yet well-meaning parents, and those memories stay with us and impact us every day. Marion's book is a wonderfully touching revelation of her experiences growing up in a dysfunctional family. It is amazing that she was able to grow into the kind, thoughtful, and loving woman she is now. Reading her book brought to the surface many of my own unfortunate events in earlier years. While painful to look at, it is quite cathartic to face those events now, recognize their impact, and choose to forgive and move on with life. Marion's book is well written, easy to read, will bring tears to your eyes, and a smile to your face! What a fabulous talent Marion has to be able to touch readers in such a way. Please read Little Madhouse On the Prairie...TODAY! It is interesting how some children survive these tragedies and go on to forgive, and be able to love again, as Marion has done. Speaking as a lawyer who defends domestic violence victims in civil court, I know how truly hazardous it is for abuse victims. There are numerous laws which can serve to protect victims, but the problem is the personality of an abuser, who is often cunning and controlling. It is inspiring to hear how Marion survived this “madness” despite the toll it took on her. I was also glad to learn about how she grew as a person, to learn compassion and love, both for her abusers and for herself. She is truly victorious in the game of true humanity. I had the privilege of reading "Little Madhouse on the Prairie" by Marion Witte. First I must commend Marion on the time she spent researching her family lineage to lay a base for understanding and compassion. Second, and most amazing, is the time she spent to dig deep and recount her memories and her feelings about her childhood experiences and painstakingly place them on paper. Finally, is the remarkable and creative way she was able to reach understanding and personal healing, with a hopeful message to us all. I feel this book's purpose is to start a movement that is multi-dimensional in the continued healing of the child within at any age. I thank Marion for what must have been a grueling process of recounting her life and abuse for us with such honesty and purity and with the ability to lead us through her journey to a process of healing and hope. Brilliant and well done. It was a true honor to read this story and celebrate her continued evolvement.